that the voltmeter provides an infinite resistance. Put R = 1V and R$_1$= 3R$_2$. $_2$ are I$_1$ = 0 and I$_2$= E/R$_2$ respectively. But I could not understand what will happen Immediately after the switch is turned off. This is very similar to your other recent question potential difference across inductor. The only significant difference is that you now have capacitors in the circuit as well as inductors. Capacitors store voltage whereas inductors store current. Follow the same method of solution as in the linked question. That is : (1) find the steady-state currents through the inductors and voltages on the capacitors; (2) when the battery has been disconnected replace each capacitor and inductor by an ideal battery (no internal resistance). The capacitor batteries will have the steady state voltage - in sign as well as magnitude. The inductor batteries have unknown voltages, which can be found by applying Kirchhoff's Laws, and are such that the steady state currents continue to flow through each. Note that charge can flow "through" capacitors in the transient state (immediately after the battery is disconnected) but not in the steady state. Also, the voltmeter has infinite resistance so effectively no charge flows through it - both in the steady state and the transient state.. When battery is disconected , the current in each loop will be different at steady state when battery is connected . And why is it so that capacitor store voltage and inductor current . When the battery is disconnected, the current through each inductor will remain the same, and the voltage of each capacitor will remain the same. Both of these start to decay exponentially from their steady-state values as soon as the battery is disconnected, but immediately after the battery is disconnected they have their steady-state values. The capacitor stores charge. Because $Q=CV$ and $C$ is constant it also stores voltage. When the battery is disconnected the voltage across the capacitor does not change instantaneously, as it does for a resistor. The voltage decays gradually, as charge flows from the capacitor. The inductor stores energy in the magnetic field. If the current through it drops, the inductor opposes this change by creating a "forward emf," using some of the stored magnetic energy to increase the current. 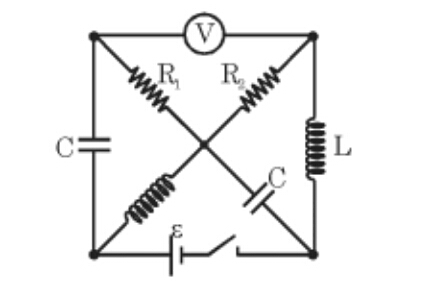 If the current throught the inductor increases, it opposes this change by using some magnetic energy to create a "back emf" to reduce the current.